My mom made almost all of the Halloween costumes I can remember from my childhood. Bride, witch, Barbie doll, Grinch (my brother)… she found patterns to sew, and when there was no pattern she made up her own. I didn’t realize at the time just how much work it was, but I loved every Halloween costume and went all out with it every year through high school, and even college (though by then I was putting together my own costumes). I would love to do the same for my kids, but this year I found myself browsing Pinterest with less than one week until trick-or-treating, still undecided about Corban’s and Mara’s costumes. At that point, it had to be something simple if it was going to be homemade. Then I found a pair of mouse ears from my sophomore year of college, when two friends and I dressed up as the three blind mice. Bingo! 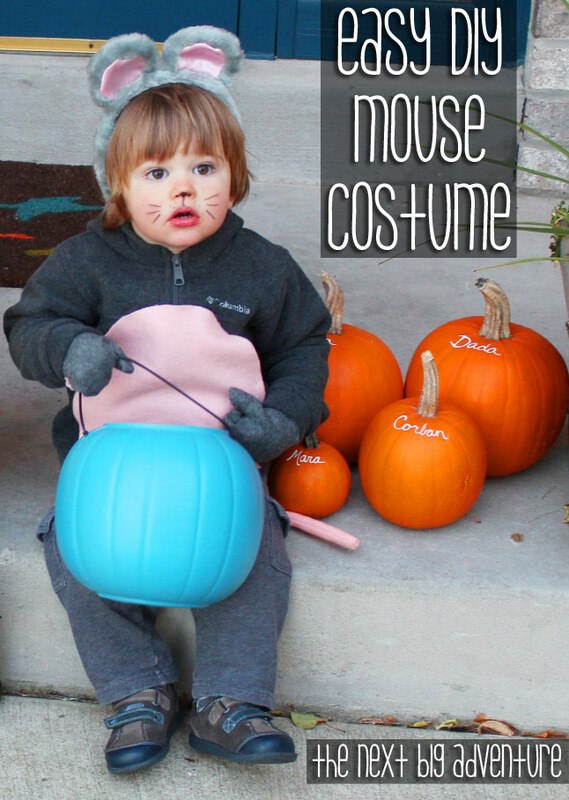 It would be easy to make him a simple mouse costume, and Mara could even be a cat. It only took one (long) naptime to make this costume, and I didn’t have to buy anything at all! 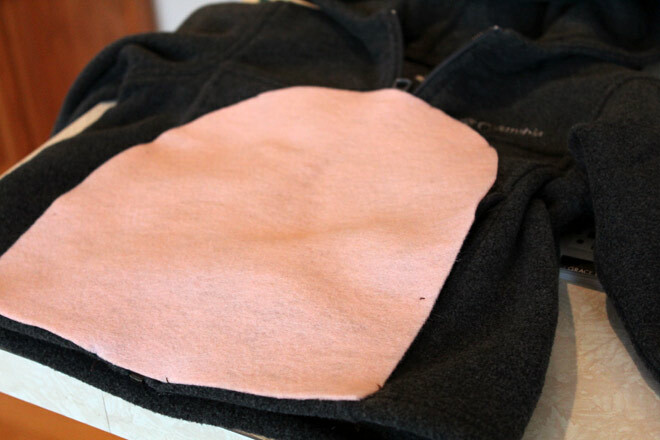 I cut one sheet of the pink felt to make the pink belly, and sewed it onto Corban’s gray fleece jacket using only a handful of single stitches spaced a few inches apart. 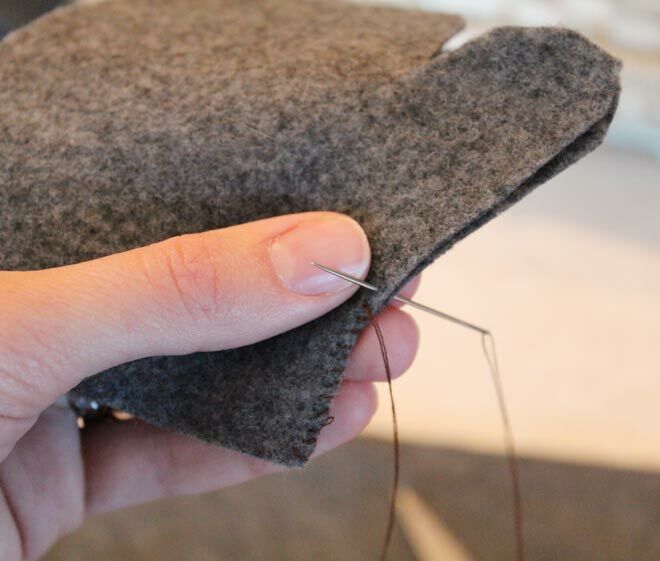 I wanted to be able to easily remove it after Halloween without any damage to the jacket. I just pulled it over his head to put it on him come trick-or-treat time. I decided to make mouse paw mittens, which aren’t really essential to the costume, but ended up being my favorite part. 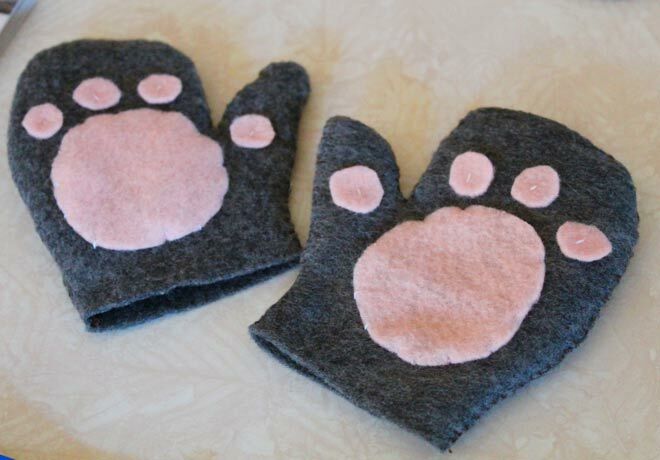 If you have gray mittens, you can just sew the pink paws onto them instead of making the mittens themselves, but for some reason I find that hand stitching a pair of mittens is less stressful than going out shopping to find a pair. 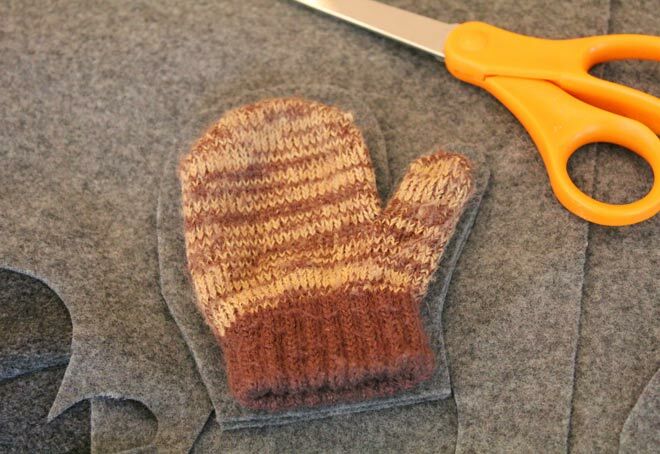 I turned the stitched mittens inside out and prayed that they would fit Corban (he was still sleeping). Then I cut a few rough circles of pink felt and stitched them onto the palms of the mittens. Lastly, the tail. 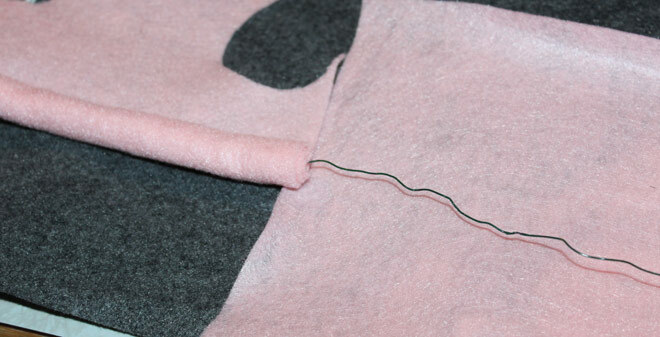 For this, I just hot-glued some pink felt into a roll, including in the middle of the roll a thin piece of wire we had lying around. I ended up making the tail way too long (this is what happens when your child is not in your range of vision — you forget how short he is!) so I pinned it pretty high up inside the back of his jacket once he was wearing it. For the nose and whiskers, first I tested out some homemade, all natural face paint by mixing a little bit of baby lotion with cocoa powder (for brown) and frozen raspberries (for pink). I did not want to put face paint on my babies for fear of exposing their gentle skin to potentially dangerous chemicals. The homemade face paint was a giant fail! If there were a natural way to make black face paint, that would be one thing, but the brown just looked like chocolate (or you-know-what) on my face when I tested it. The pink actually turned out OK, but I don’t think it would have lasted very long on Corban’s or Mara’s noses. So I went the eyeliner route instead. I’m sure there are chemicals I don’t want to know about in eyeliner, but I just told myself since it’s made to be applied near one of our most sensitive areas (the eyes) it can’t be that bad on baby cheeks and noses. 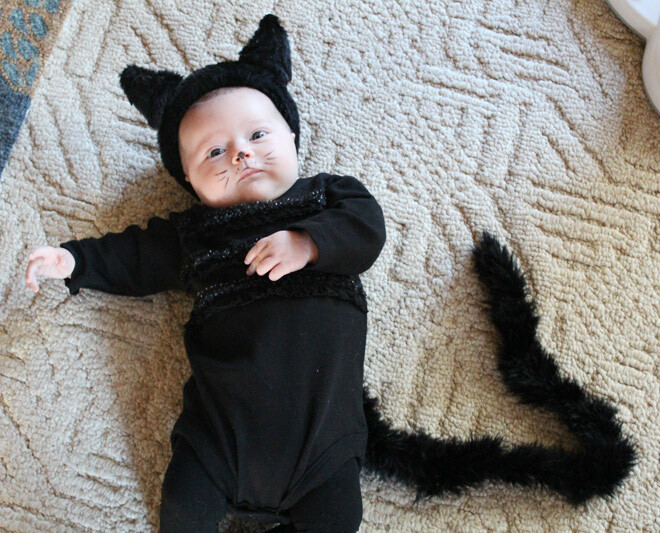 My little kitten wore cat ears we already had, a black onesie, black tights and a small boa tail. Trick-or-treating was on Sunday in our city (I know, the Milwaukee area is weird and every city has its own trick-or-treat day and time, which is often not on Halloween). 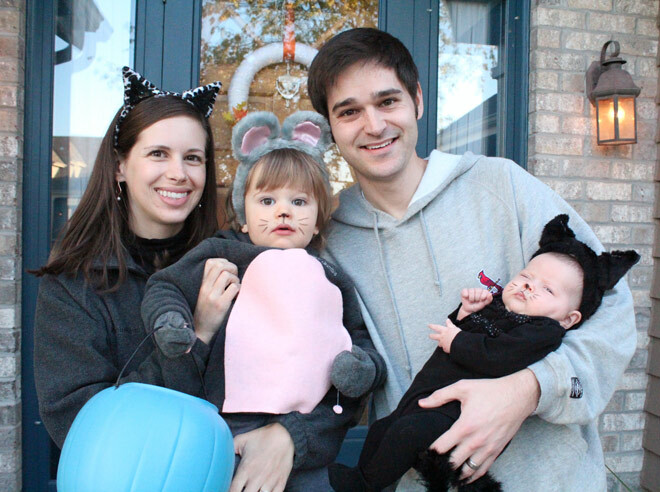 We went with friends who have two toddler girls and it was such a blast watching the little ones scramble up to each door on our street and reach their mittened little hands into bowl after bowl full of candy. 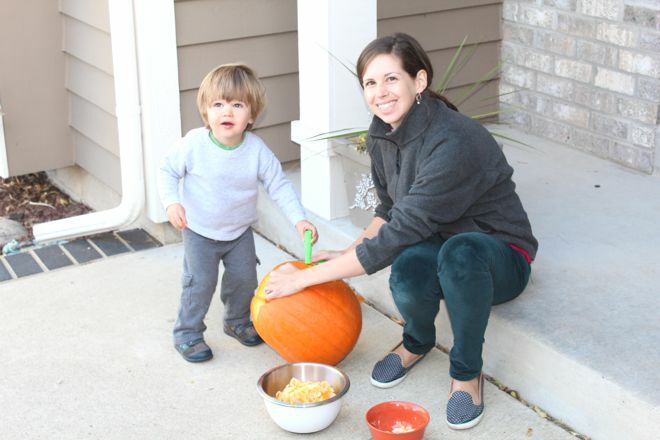 Corban also helped me carve our big pumpkin that afternoon. It all reminds me once again what a fun age he is at. 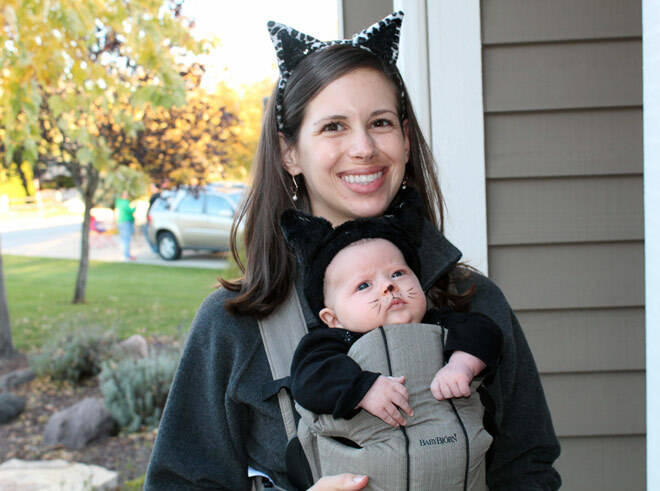 Your turn: What are your little ones being for Halloween? Or what were you as a toddler? 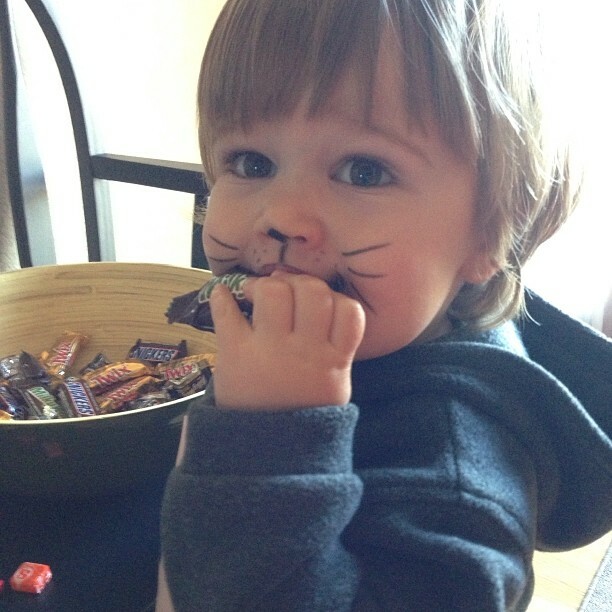 Toddler Halloween is the cutest! You are too cute! This is so creative!! Miss you Alison!